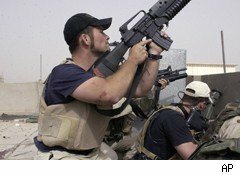 Blackwater, the infamous private security firm that provided mercenaries for the U.S. war in Iraq, is looking for a buyer. As it prepares to go up for sale, it is trying to rebrand some sections, retire others, and emphasize still others in order to increase its market value. One part of the strategy is a move into retail. The company, which already operates an online store, now plans to open brick-and-mortar stores in Fayetteville, North Carolina, and Salem, Connecticut. The "Blackwater Pro Shop" outlets will carry a wide variety of paramilitary equipment, and for customers who want to test out the merchandise there will be on-site indoor gun ranges. Blackwater Pro Shops are more than just the next generation of surplus stores: Blackwater is also using them to promote its brand. The Pro Shop website offers dozens of Blackwater-branded products, ranging from t-shirts to coffee mugs, mouse pads to rifles. Some of the goodies allude to Blackwater's global deployments: for $15, the company's fans can buy a "Camp Integrity" t-shirt, commemorating the contractor's base in Afghanistan. Blackwater's new outlets are located near two of the largest military bases on the East Coast. Salem is 25 minutes from Naval Submarine Base New London, the Navy's main sub base, and Fayetteville is 20 minutes from Fort Bragg. The North Carolina store seems particularly well-situated: Fort Bragg, a 251-square mile Army base that houses over 20,000 soldiers, is home to several of the U.S. Army's elite special forces units. In the past, Blackwater recruited heavily from the ranks of retired special forces soldiers, and the company is aggressively targeting that niche market. In addition to its own line of "Blackwater" merchandise, the Pro Shops carry a selection of items from the "Pipe-Hitter's Union," a group that also claims a connection to the "Military/Special Operations community." The Pipe-Hitter's motto -- "Good people sleep peacefully in their beds at night only because rough men stand ready to do violence on their behalf" -- suggests a particularly dark view of international relations. Blackwater's involvement in warfare overseas left the brand severely tainted. During its sojourns in Iraq and Afghanistan, the company was cited for (among other things) a mass shooting of Iraqis, keeping a prostitute on its payroll in Afghanistan (under the heading "Morale Welfare Recreation"), and plotting the assassination of jihadists. To say that these donnybrooks hurt the company's reputation would be an understatement; in 2009, after it was kicked out of Iraq, the"Blackwater" brand was such an albatross that the company changed its name to Xe, pronounced "Zee." According to Anne Tyrrell, a spokesperson for the firm, the new name was the result of a yearlong search, but actually means nothing. In addition to its renaming, Xe has worked hard to distance itself from its scandals. Last year, five top executives who were involved in Blackwater's Iraqi and Afghan operations left the company; in April, they were charged in a criminal inquiry into the company's actions. At the same time, Xe also prepared to shift its mercenary operations to reduce its exposure. In March, it sold its aviation group for $200 million to AAR Corp, an Illinois-based company that was attracted by the division's extensive government contracts. Xe is an umbrella for at least three companies. In addition to the Blackwater Pro Shops, it runs a training school and a security services firm. The school, U.S. Training Center, operates in North Carolina, where it prepares students for a "wide range of missions, terrain and tactical situations." Recently, Senate Armed Services Committee chairman Carl Levin (D-Mich) proposed refusing its bid for a $1 billion contract to train Afghan police. Xe is still in the mercenary game, but its security provider, Greystone Ltd, seems designed to combat many of Blackwater's vulnerabilities: Incorporated in Barbados, it is shielded tom some extent from the reach of American lawmakers. And, according to Mother Jones, Greystone also draws its contractors from a cheaper, more exotic labor pool: while Blackwater heavily recruited from the ranks of former American soldiers, Greystone hires soldiers from third-world countries. Over the course of the last year, an interesting thing happened: In the delicate world of international relations and peacekeeping, Blackwater's behavior and its ignominious retreat from Iraq have made the name a tainted brand. However, for an increasingly vocal, hawkish segment of the population, Blackwater's scandals -- and its role in the aggressive foreign policy of the Bush administration -- seem to represent an attractive alternative to the measured, less belligerent approach of the Obama White House. In this context, Blackwater Pro Shops suggest professionalism and a rough-hewn morality, giving the impression of a sort of real-life A-Team. As they move into the retail market, it remains to be seen if the new Blackwater will be able to wash away the stains of the past. Blackwater did not reply to requests for comment on this story.